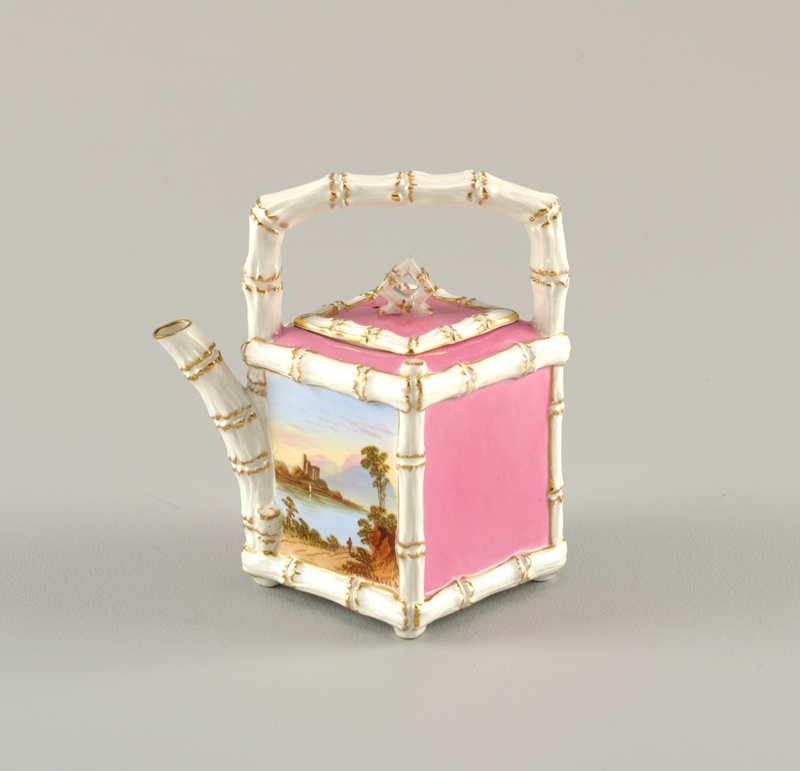 To the modern eye, this 19th century teapot, made by Edwin James Drew Bodley, who was in charge of an English china and earthenware manufacturer in Staffordshire, might border on kitsch. The spout, handle and edges are decorated with moulded bamboo stalks, with gilding to accentuate their nodes. Bright pink panels feature on two opposing sides, as well as on top. A Romanticism-inspired landscape painted with enamelled brushstrokes is visible at the front. The body of the teapot is unmistakably square. These striking aesthetic elements, are, of course, what make this particular object so interesting. The body of the teapot strongly resembles a Chinese-style pagoda. The teapot’s top and lid especially give it the look of a tiered roof, which is one of the most characteristic aspects of pagoda architecture. Although it is unclear if bamboo was used as a construction material in Chinese pagodas, the bamboo-shaped elements that feature on this teapot could simply emphasize the Chinoiserie style. The vivid bubble gum pink color, arguably the most striking aspect of this object, could be a loose reference towards a group of Chinese ceramics called ‘famille rose’ that was characterized by the use of opaque overglaze rose colors such as carmine and pink. [ii] The painted landscape lends the teapot a particularly British feel. The sky illuminated by the setting sun along with the mythical castle in the background look like something that an artist trying to imitate J.M.W. Turner could have painted. These individual elements come together to create something that is Chinese in influence, but British in nature.